‘Spoils of War’ is an astonishing, breathtaking, heart-wrenching episode that finally delivers what has long been promised. In an episode that’s padded out with political posturing and a longed-for reunion, the explosive third act comes as a flaming surprise that finally shows Daenerys (Emilia Clarke) as a force to be reckoned with. Daenerys has suffered exceptionally bad luck in Season 7. Having lost most of her allies, Clarke’s character is trapped between what she should do and what she must. Quite surprisingly, it was Jon Snow (Kit Harrington) to whom she turns for advice. After becoming frustrated with her current advisor’s lacklustre response to Cersei’s (Lena Headey) destructive power, Snow seems like her best chance. This shift is startling and highlights Daenerys’ desperation to find a solution to her mounting problems as Jon continues to defy her demands for bended knees. Despite this seeming growth, Jon and Daenerys’ relationship continues to be turbulent as he emphasises the North’s reluctance to follow a Targaryen. If only they knew! Jon’s stubbornness marks him as a just ruler who respects the will of his people, but Daenerys comes across as a petulant child fixated on the illusion that birth-right guarantees loyalty. It’s a huge shame as we have come to respect Daenerys for achieving the impossible through her veracity rather than her heritage. In contrast, Cersei takes a back seat in this week’s episode. After her numerous victories in previous episodes, she only features in a single scene in which she impresses upon Tycho Nestoris (scene-stealer Mark Gatiss) the record time in which her debt will be paid. In Winterfell, Bran (Isaac Hempstead-Wright) continues to detach himself from the world around him, withdrawing deeper into his newfound visions. Bran’s unflinching reaction to Baelish’s tale of lust over Catelyn and his blithe acceptance of the dagger which mutilated his mother’s hands is the most anti-climactic scene of the episode. For all the darkness hanging over Winterfell there is a glimmer of hope and her name is Arya Stark. Arya’s (Maisie Williams) homecoming rejuvenates Winterfell and brings about some much-needed relief. 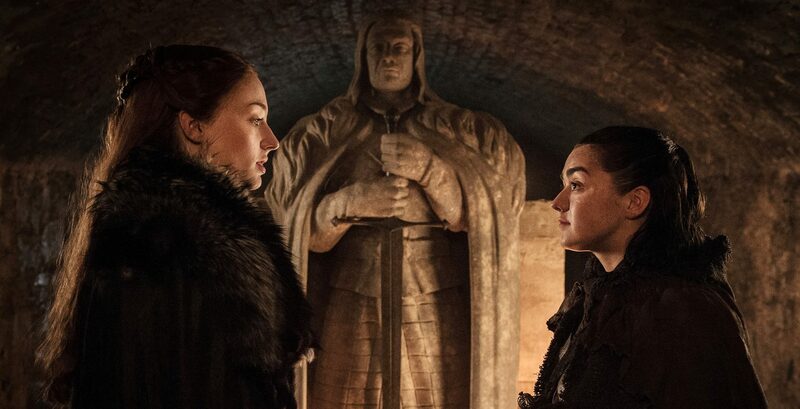 Sansa and Arya’s reunion was everything fans could have wished for, the two embracing and finally reconciling their differences. Alas, this meeting is bittersweet as both women recognise the amount the other has changed. Sansa is finally a Lady and Arya is a warrior, but neither of them know how to rationalise what has happened during the intervening years. Sansa is clearly in denial, laughing when her little sister explains her kill list, but the reality of what Arya has become quickly dawns on her. Sophie Turner plays this brilliantly, expressing so much in subtle changes of expression, making it clear that Sansa fears Arya’s newfound killer nature. The highlight of Arya’s homecoming is her meeting with Brienne. The two women fit together so perfectly that seeing them sparring and learning from one another is breathtaking. However, as the stunning fight goes on, Arya’s predatory instinct takes hold and there is a foreboding sense that she won’t be able to hold back. She’s become an incredibly skilled and powerful fighter, but the treachery she’s witnessed has already awoken something very dark within her. I suspect she’ll be grappling with this for the remainder of the season. Following Highgarden’s defeat, Jaime (Nikolaj Coster-Waldau) is conflicted despite his victory. In the past, Jaime has been nothing short of ruthless and yet he cautions his men against violence when farmers refuse to relinquish their crops. Given her huge impact, it’s rewarding to see Olenna’s (Diana Rigg) final words have some bearing on Jaime’s actions. There’s very little that can be said about the ensuing battle. The sheer magnitude of seeing two massive characters that fans have come to love and admire on opposite sides of the battlefield is too momentous for words. The artistry used by the creators to depict the visceral chaos and carnage of war is astounding, possibly topping all previous battles. Despite all the excitement when Daenerys joins the fray on Drogon’s back, it was Bronn who stole the show. It really rekindles fans adoration for Jerome Flynn’s loveable rogue. Channelling The Hobbit’s Bard, Bronn took on Drogon single-handedly, launching giant arrows at the beast. I imagine that many fans found this difficult to watch as loyalties to Bronn and a desire to see Daenerys succeed went head-to-head. The biggest shock of the night came when Tyrion’s ‘f***ing idiot’ of a brother charged Drogon. For the first time ever, the show ended on a cliffhanger neither confirming nor denying Jaime’s demise, but a cryptic Tweet from the actor just might have. ‘Spoils of War’ is without doubt one of the most satisfying episodes to date. All episodes of Game of Thrones are available on demand and continues next week with ‘Eastwatch’. See the teaser below.